Guide to Caribou County, Idaho ancestry, family history, and genealogy birth records, marriage records, death records, census records, family history, and military records. The county was named for the Caribou Mountains, which in turn are named for Cariboo Fairchild, who had taken part in the gold rush in the Cariboo region of British Columbia in 1860. The County Seat is Soda Springs and was founded February 11, 1919. It is located in the southeast area of the state. 2 Nov. 1948 - Caribou gained from Bannock County. Areas gained were described in two separate acts approved 18 Mar, 1948, became effective through a vote in the general election of 2 Nov. 1948. This annexation involved the residents of Commissioner's District #3 of Bannock County which included all of Gem Valley from Chesterfield to the Devils Hand Canyon, (Bancroft, Grace, and the lower Gem Valley). This list of places in Caribou County, Idaho was compiled from the Lists of Places in Idaho in Wikipedia and from the map of Caribou County in Virtual Earth. The types of records that follow are used for genealogy and family history. Most tell what you may learn and how to locate the records. Links to Internet sites usually go directly to Caribou County, Idaho Genealogy entries with names, images, or information. Don't overlook Caribou County, Idaho Genealogy items in the FamilySearch Library Catalog. For other libraries (local and national) or to gain access to items of interest, see Archives and Libraries. Many of the older court, land, naturalization, probate, pension, and vital records for Caribou County have been microfilmed and are available at the Family History Library in Salt Lake City and through their family history centers. They are also available at the Idaho State Archives in Boise. Details of the county records in these respective institutions can be obtained from their online catalogs or listings. Original records which have been microfilmed and more recent records are in the county courthouse in Soda Springs. There are many cemeteries in Caribou County. For a list of those that have been identified, and links to transcriptions and/or photographs of tombstones, go to Caribou County, Idaho Cemetery Records. List of Caribou County stakes and wards to about 1948. The following are local congregations (wards) which existed in Caribou County, Idaho prior to 1950. Some of the early court records of Caribou County, Idaho have been microfilmed and are available at the Idaho State Archives in Boise, Idaho. The records filmed include civil suits, divorce papers, judgment dockets, etc. Copies of these microfilmed court records are also available at the Family History Library in Salt Lake City, Utah or at any of the Library's Family History Centers. Additional court records and more recent records are housed at the Caribou County courthouse in Soda Springs, Idaho, and can be accessed by making a visit there. The book Caribou County Chronology is a brief history, published in 1930. 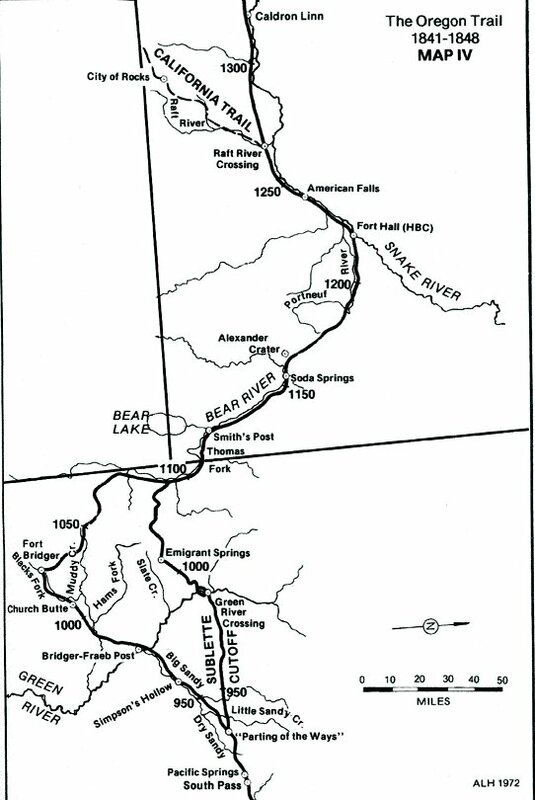 The Soda Springs Chamber of Commerce has compiled the Oregon Trail in Caribou County, a self-guided tour of sites documented by diaries and journals of early pioneers and explorers, available online. A work highlighting the county's mining history is The mountain: Carriboo and other Gold Camps in Idaho available at various libraries nationwide. Land and Property records are generally found in the Clerk's Office of the county in which the transactions took place. They can be accessed by contacting that Caribou County Clerk's office, which in Caribou County is located in Soda Springs, Idaho. The Idaho State Archives has microfilmed some of the earlier records of Caribou County and these can be accessed by visiting the Archives in Boise, Idaho. The Family History Library in Salt Lake City has microfilmed the following records found in the Caribou County Clerk's Office: Homestead Records 1889-1964, Deeds 1901-1935, Patent Records 1889-1950. These films are available for viewing in Salt Lake City or in any of the Family History Centers. A digital Caribou County Idaho map is available online. Map of Caribou County, Idaho is available online. Because Caribou County was not formed until 1919, those who were of military draft age for World War I were included in the draft registration records of Bannock County, the parent county of Caribou. Both the Idaho State Archives in Boise, Idaho, and the Family History Library in Salt Lake City, Utah have copies of the miscellaneous record of Teton County. The originals are held in the Teton County courthouse in Driggs, Idaho and can be accessed by visiting there. Copies in the Idaho State Archives are available for viewing in Boise. Those held by the Family History Library can be viewed either at the Library in Salt Lake City or at any of its Family History Centers. Caribou County Sun, published in Soda Springs. Mothers' Pensions were provided by the State of Idaho for widows and/or orphans, under certain conditions. Petitions for those pensions were filed with the probate court in each county. The original papers for several counties have been transferred to the Idaho State Archives in Boise and have been indexed. Caribou County Mothers' Pensions are included in that index which is available online. Microfilmed copies of these Mother's Pension records are also available at the Family History Library in Salt Lake City, Utah, or in any of the Library's Family History Centers. Microfilm of the originals are also found in the Caribou county courthouse at Soda Springs, Idaho. Probate records are generally found on the county level and can be accessed by contacting the county courthouse in which the transactions took place. The Caribou County courthouse is located in Soda Springs and the records can be accessed by visiting there. The Idaho State Archives has microfilmed some of the early Caribou County probate records and these can be accessed by visiting the Archives in Boise, Idaho. The Catalog/frameset_fhlc.asp Family History Library has filmed Caribou County probate records (1898-1926) and these films are available for viewing at their facility in Salt Lake City or in any of its Family History Centers. Any existing tax assessment rolls for Caribou County should be in the courthouse in Soda Springs and would need to be accessed by visiting there. Birth records, 1911 to present, for individuals born in the Caribou County area are included in and recorded at the state level. These records are restricted for a period of one hundred years from the time of the individual's birth but can be obtained by following the guidelines as issued by the State of Idaho. See the [[Idaho_Vital_Records|Vital Records] ]section under the subject Idaho for more details. The Idaho State Archives and the Family History Library in Salt Lake City, Utah have microfilmed copies of Caribou County marriages 1919-1944, the originals of which can be viewed at the Caribou county courthouse in Soda Springs. The filmed copies can be viewed at the Archives in Boise, Idaho or at the Family History Library in Salt Lake City, or in any of the Library's Family History Centers. Deaths occurring in Caribou County are included in the state-wide registration program. These records are restricted for a period of fifty years from the time of the individual's death but can be obtained by following the guidelines as mandated by the State of Idaho. See the Vital Records section under Idaho for details. Anderson, Lavina Fielding (ed). Chesterfield: Mormon Outpost in Idaho. Bancroft, Idaho: The Chesterfield Foundation, Inc., 1982. 91 pages. ↑ Handybook for Genealogists: United States of America, 10th ed. (Draper, Utah: Everton Pub., 2002), Caribou County, Idaho. Page 177-180 At various libraries (WorldCat); FHL Book 973 D27e 2002; Alice Eichholz, ed. Ancestry’s Red Book: American State, County, and Town Sources, Third ed. (Provo, Utah: Ancestry, 2004), 180-181. ↑ Handybook for Genealogists: United States of America, 10th ed. (Draper, Utah: Everton Pub., 2002), Caribou, Idaho page 178, At various libraries (WorldCat); FHL Book 973 D27e 2002.